TULSA, Okla. — With 221 rounds of competition complete in the 33rd Lucas Oil Tulsa Shootout, the stage is nearly set for a Sunday showdown, with 110 drivers from 17 states already locked into at least one of the eight championships A-Feature events. Of the 110 that can breathe a little easier on Sunday, 16 will have multiple chances to score a Golden Driller, but none to this point have more opportunities at the coveted trophy than Broken Arrow’s Jason McDougal. 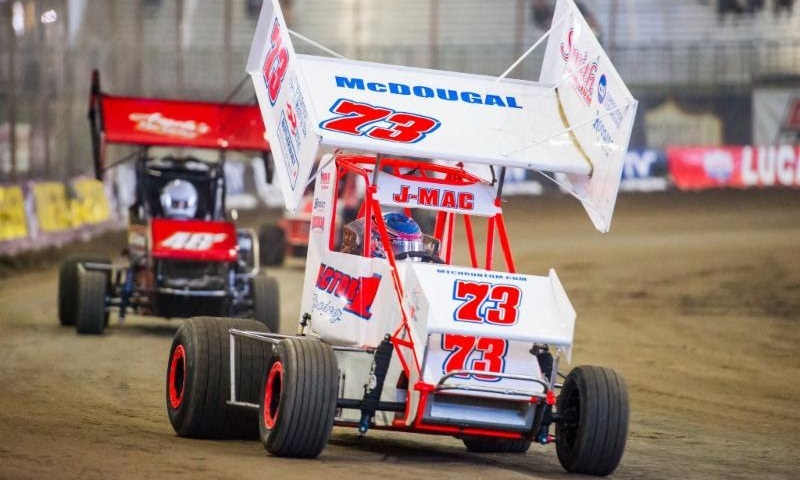 Having never topped the Tulsa Shootout, McDougalhas landed his Factor 1 Racing No. 73 in four A-Features and has earned the pole in both A-Class and Stock Non-Wing competition. In Outlaw Wing and Non-Wing, he will roll off the grid fourth. Earning a spot in A-Class, the division he topped one year ago, Missouri’s Ayrton Gennetten enters Sunday with a total of three chances a a Driller. He also has feature starting spots in Non-Wing Outlaw and Stock Non-Wing. Looking to add a fourth Golden Driller to his collection, Tulsa’s Chris Andrews is the second of three drivers with starting spots in three A-Features, while 2017 Lucas Oil Chili Bowl and NASCAR Camping World Truck Series champion Christopher Bell is eyeing his first Shootout win. With another dozen on the list that have two chances at glory, the lineup includes six former champions, including defending winners Joe B. Miller, Tyler Walton and Frank Flud, who also boasts a 2015 win and a pair of triumphs in 2014. Topping competition in 2016, Miles Paulus has made the cut, with 2014 winner Cannon McIntosh and 2011 champion Andrew Deal also making the call. Noah Harris, Ryan Timms, Slater Helt, Tom Curran, Will Edwards and Zeb Wise will look to double up for their first trip to victory lane.